A great gift idea! A bottle of this stir-fry sauce, presented in a simple rustic-style gift bag tied with raffia and a suitable 'garnish' of chopsticks, will be a welcome gift for seasoning a quick and easy stir-fry dish. Combine all ingredients; over and refrigerate 8 hours. Pour through a large wire-mesh strainer into bottles, discarding solids. Store in refrigerator up to 4 weeks. 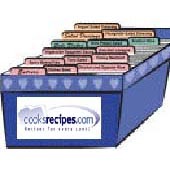 Marinate 1 pound beef, chicken or pork strips in 1/2 cup Stir-Fry Sauce 30 minutes. Drain, reserving sauce. Cook meat in 1 tablespoon vegetable oil in a large skillet, stirring constantly, until done; remove from skillet and keep warm. Add 4 cups mixed vegetables, cut in similar-sized pieces, to skillet; stir-fry 2 minutes or until crisp-tender. Combine 1 tablespoon cornstarch, 1/2 cup water and reserved sauce; add to vegetable mixture and cook for 1 minutes. Return meat to skillet and cook until thoroughly heated. Serve over cooked rice. Store remaining sauce in refrigerator up to 4 weeks) Makes 4 servings.